Every year, thousands of Australians are victims of graffiti attacks, but Dulux has come to the rescue with its new Dulux Precision® Anti Graffiti Coating. The DIY coating enables graffiti to be cleaned off, again and again, with a high-pressure water cleaner, as its revolutionary high-performance coating allows homeowners to protect their property from unwanted attack. “With the launch of Dulux Precision® Anti Graffiti Coating, we are empowering homeowners because they can now do something about it themselves. Dulux has developed Precision® Anti Graffiti Coating to resist all graffiti paint systems, spray paints and markers, and it only needs to be applied once to provide ongoing protection. This means homeowners can simply wash away the offending tagging each time without affecting the surface,” Dulux Senior Brand Manager, Briana Keenahan said. 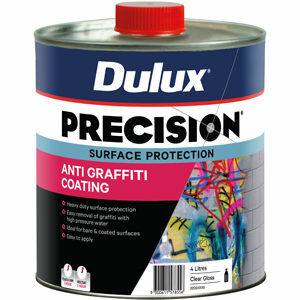 Suitable for painted and unpainted surfaces including timber, concrete and brick surfaces, Dulux Precision® Anti Graffiti Coating is easy to apply with a brush, roller or spray gun. The coating is fast drying, low in odour and VOCs, and provides an effective barrier against dirt, acid, road grime and pollution.